Have you heard of MyPoints? It’s a cash-back site that pays you to print coupons and shop online. We love it around here — it’s an instant way to save on everything you buy. Next time you plan to shop online, use MyPoints to get this awesome deal: Spend $20, and get a free $10 gift card for The Home Depot! Sign up for MyPoints here (you just need to give them a name and email address). MyPoints instantly sends an email to confirm your email address — you’ll need to click it to get the free gift card. Lastly, you’ll need to purchase $20 worth of products online through the MyPoints shopping portal. MyPoints will reward you with 1,750 bonus points, which you can then redeem for a $10 Home Depot gift card. Almost any shopping counts toward points for your $10 reward, so MyPoints can help you save money on just about anything you want to buy this summer. As an example, look how you can use MyPoints to save money on a weekend home improvement project — like staining your deck. Buy two cans of oil-latex redwood stain for about $10 each on HomeDepot.com through MyPoints. Choose in-store pickup for free shipping. Earn reward points for your purchase. MyPoints offers two points per dollar at The Home Depot — 1.4% cash back. 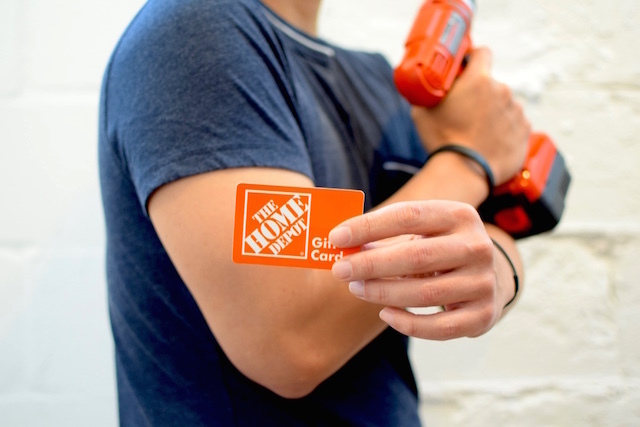 Claim your $10 Home Depot gift card to use on your next purchase. Use the gift card next time you shop The Home Depot through MyPoints for yet another 1.4% off! That’s a total of $30 in home improvement supplies for just $19.28 — equal to 36% off! This offer is available to all new members. You need to join MyPoints now and spend $20 on any shopping or travel within 30 days. You’ll be awarded 1,750 points, redeemable for a $10 gift card of your choice. After shopping, rewards points will appear in your account within 30 days, but it usually takes less than five business days. If you request a physical gift card, it should arrive in the mail within two weeks — and e-gift cards show up in your inbox within 30 minutes.